Last night I channeled Julia Child. I wanted to make something French, but I also didn’t want to spend hours slaving in the kitchen. When I think of French food certain words come to mind: fancy, expensive, difficult, pretentious. Totally doesn’t go with the theme of my blog, right? French food can actually be the opposite of this though– light, simple , easy and affordable. I certainly wasn’t in the mood to make Escargots à la Bourguignonne for myself and I also didn’t want to experiment with duck or Pâté. Seafood sounded good so off I went to Whole Foods. Side note: I’m sort of a fresh seafood snob. Other than frozen shrimp, I refuse to buy anything but fresh, natural, local(ish) items from the ocean. I rarely buy the stuff on sale (not a big deal because I usually cook for one) and I always stick to what’s behind the fish counter– the “manager’s special” of seafood is horrifying. This phobia of mine usually leads me to organic supermakets or exclusive seafood retailers. Phew, glad I got that off my chest. So of all the things we take from the sea, the scallop is one my favorites. I love food that starts off as a blank canvas and scallops definitely check that box. They take on the flavor of just about anything you add to them, but I think it’s best to not over complicate these delicate little morsels. I would definitely use sea scallops for this dish, or any scallop dish for that matter. I think the texture and flavor is better, and bay scallops have a tendency to taste a little fishy in my opinion. This recipe cooks fast so make sure you have all your prep work done ahead of time. I served mine over a bed of wilted spinach with olive oil and garlic. By the way, I’ve been buying fresh (non bagged) spinach lately and it’s changed my world, I can’t believe I just now discovered this. The texture is so much better and it’s more filling. I feel like popeye when I eat it. Sprinkle scallops with salt and pepper, dredge in flour then shake off the excess. In a pan, heat half the butter over high heat and add the scallops in 1 layer. Put heat on medium and cook the scallops 2 minutes, then flip to the other side. Cook the other side of the scallops for 3 minutes then add the rest of the butter, onion, garlic and parsley. Saute another minute or so. Add the wine and cook for 1 minute. 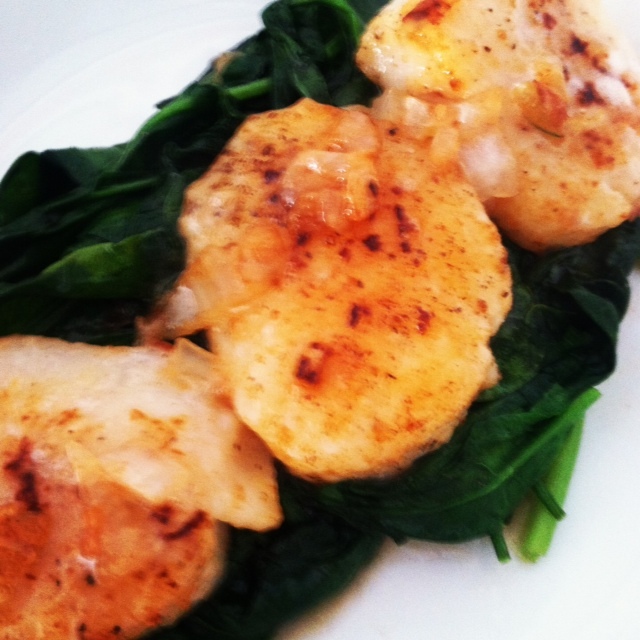 Remove scallops from pan, drizzle with sauce and add a squeeze of lemon. This looks great!! Love the story with it !